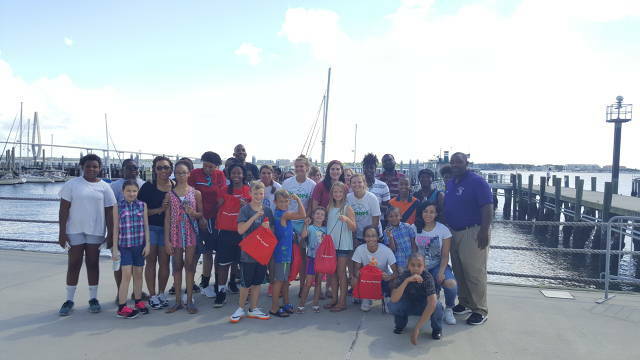 This City of Charleston annual event is sponsored by the Mayor's Office of Youth, Children and Families. The festival will be held at the Maritime Center and will take place on Sunday, August 19. Ballers will be assisting with the pre-planning events on SATURDAY, AUGUST 18. Our LOWCOUNTRY BALLERS will be filling bags/folders & bookbags donated by MeadWestvaco with various school supplies and then loading the truck. 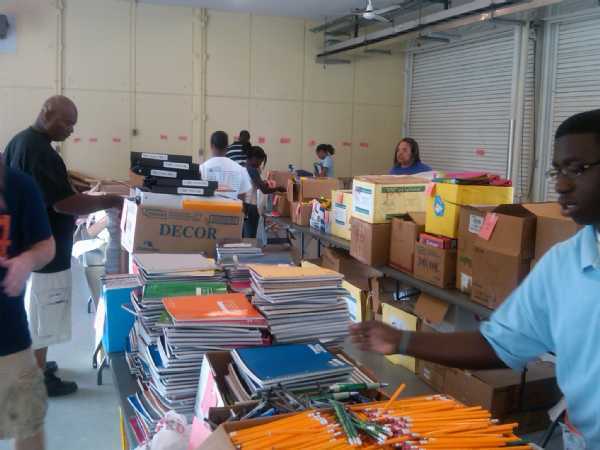 These much needed school supplies will be distributed to Lowcountry Youth at the FIRST DAY FESTIVAL SUNDAY. Registration is a REQUIREMENT in order to participate. PLEASE CLICK HERE TO SIGN UP VIA COMMUNITY SERVICE INTENT FORM!!! Ballers SHOULD arrive at the Maritime Center BY 9:00am on SATURDAY, August 18. @ 804-564-8707 or email djenkins@lowcountryballers.org. Thanks for giving back to help your community! SATURDAY, AUGUST 13th from 9:30 - NOON. The festival will be held at the Maritime Center and will take place on Sunday, August 14. 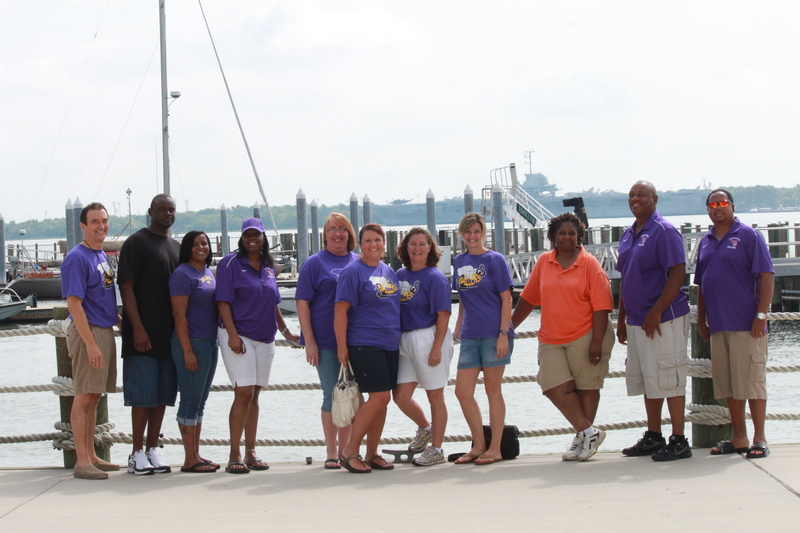 Ballers assisted with the pre-planning events on SATURDAY, AUGUST 13. 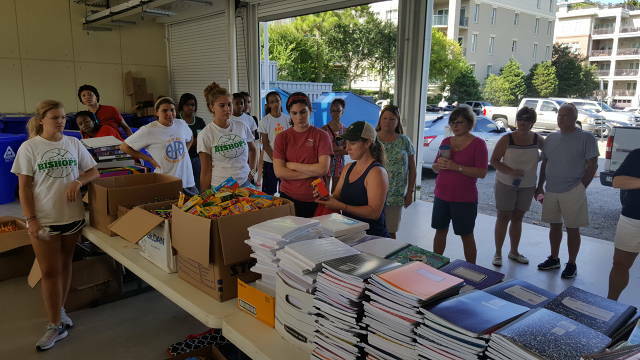 Our LOWCOUNTRY BALLERS filled bags/folders & bookbags with various school supplies and then loading them on a truck. 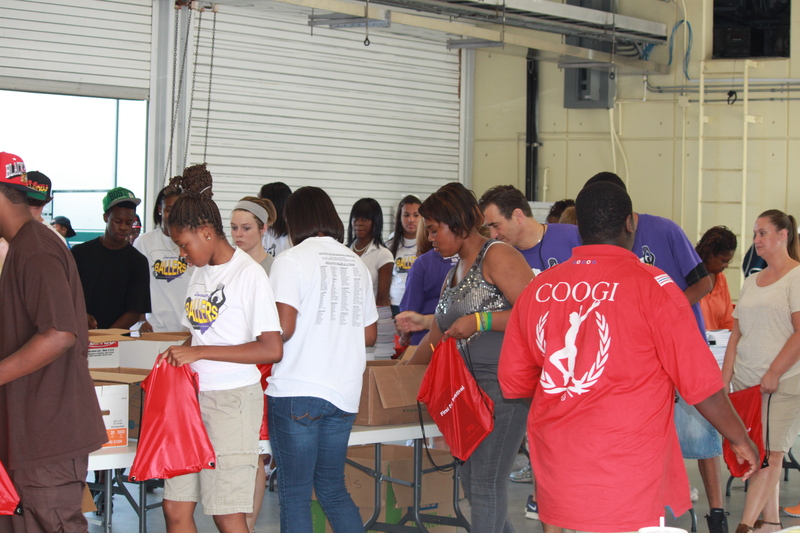 These much needed school supplies were distributed to Lowcountry Youth at the FIRST DAY FESTIVAL the next day. to all of the Ballers, Coaches, Staff, and Parents who volunteered and participated in the 2011 First Day Festival. 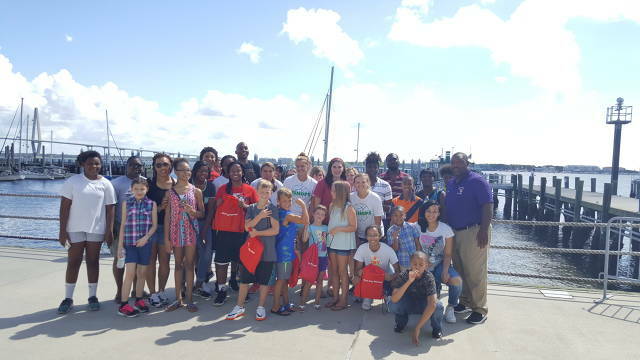 The festival was held at the Maritime Center on Sunday, August 14. 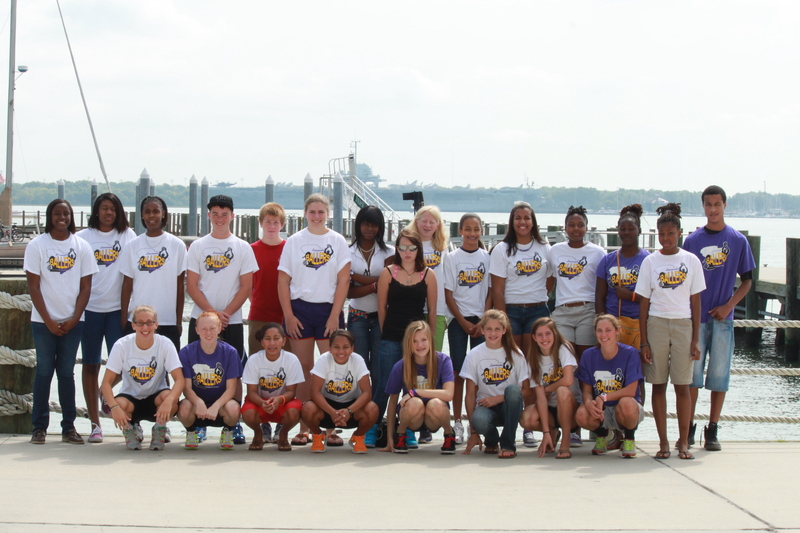 OUR LOWCOUNTRY Ballers assisted with the pre-planning events on SATURDAY, AUGUST 13. 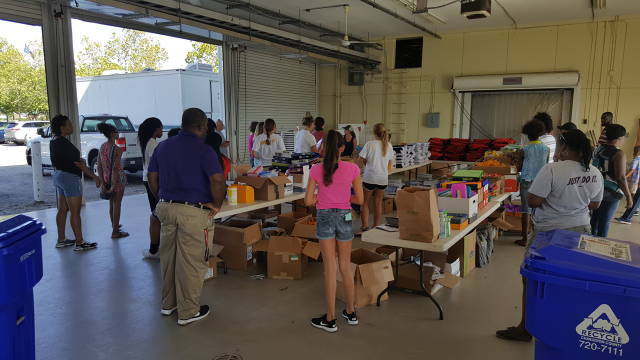 Our LOWCOUNTRY BALLERS filled over 5000 backpacks/bookbags with various school supplies!!! Ms. Vernetta Simuel for serving as the Onsite Point-of-Contact along with Ms. Pam Greene for ensuring the BALLERS successful participation! 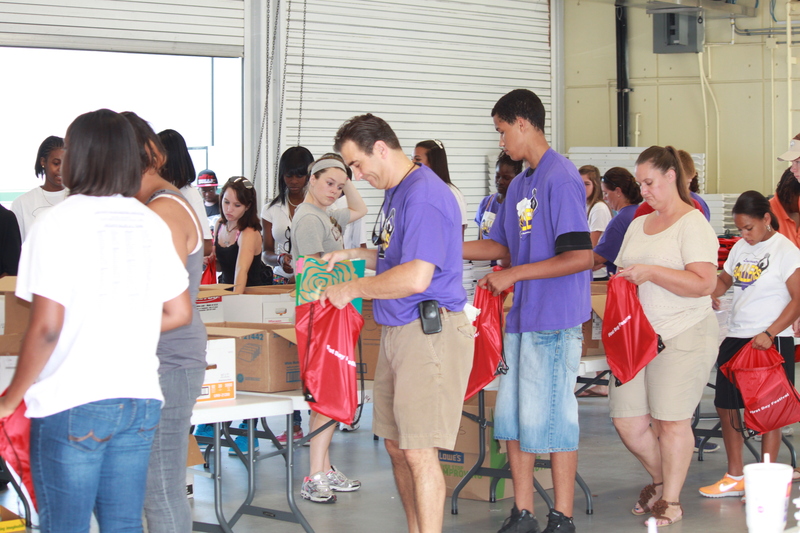 Thanks again for giving back to YOUR community and have a successful school year! Ballers will be assisting with the pre-planning events on SATURDAY, AUGUST 13. 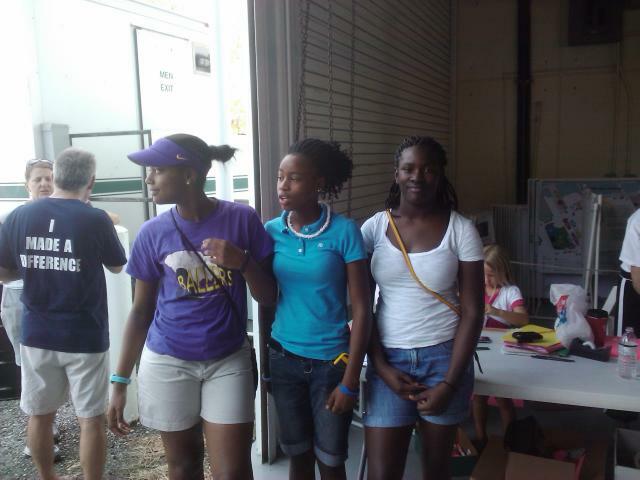 Our LOWCOUNTRY BALLERS will be filling bags/folders & bookbags with various school supplies and then loading the truck. These much needed school supplies will be distributed to Lowcountry Youth at the FIRST DAY FESTIVAL SUNDAY. Registration is a REQUIREMENT in order to participate. All Ballers who preregistered to participate names have already been sent in to Mayor's Office. Ballers SHOULD arrive at the Maritime Center BY 9:00am on SATURDAY, August 13. PLEASE WEAR A WHITE, PURPLE or ANY LOWCOUNTRY BALLERS T-SHIRT/HAT. (Parking is available in the area marked for VOLUNTEERS. On the day of the FESTIVAL parking is in the CHS Maritime Lot, SC State Ports Authority, SC Aquarium, or Gaillard Garage (for fee). as well as giving back to your community!!! @ 843-300-7874 or email daviscal12@gmail.com. 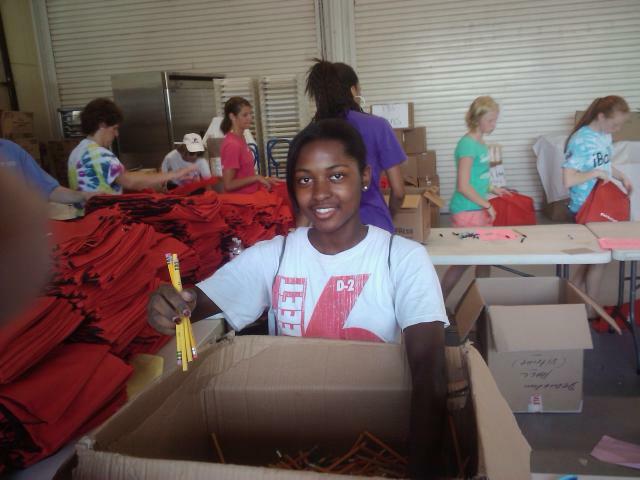 Our LOWCOUNTRY BALLERS will be filling bags/folders & bookbags with various school supplies and then loading the truck. PLEASE SIGN UP ONLINE VIA THE COMMUNITY SERVICE INTENT FORM!!! Ballers SHOULD arrive at the Maritime Center BY 9:00am on SATURDAY, August 14. 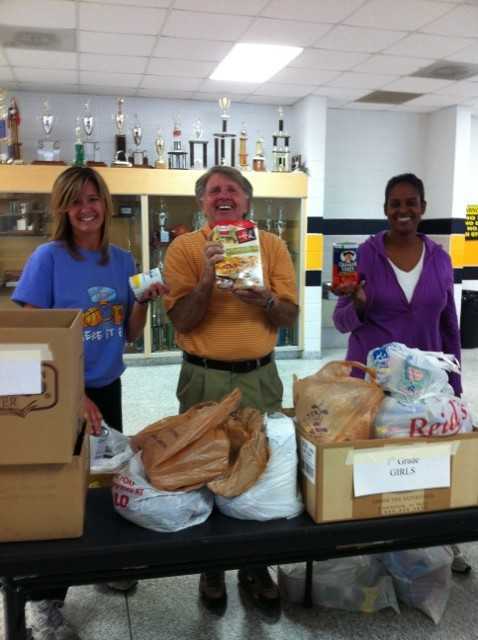 ……the winner is….. the 8th grade boys who donated 79 items in their assigned category!!! 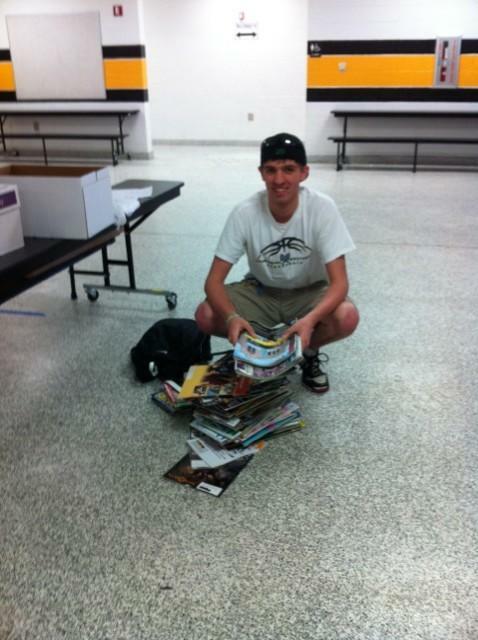 ….the Winner is….the 10th grade boys who donated 84 magazines dated after September 2010!!! It was a close competition with all teams providing numerous items requested. Some teams also donated items that were not listed in their individual requirements!! Of course the Lowcountry Community is the big winner here. OUR BALLERS donated 350 pounds of food to the Lowcountry Food Bank which equates to providing 269 meals to families in need in the Lowcountry!!! In addition, 313 magazines were given to Roper and Trident Hospitals!!! I would like to send out a huge note of appreciation to the following members of our Baller family; for assisting with the set up, calculations, packing the items for delivery, gift cards and/or distribution to the facilities. Ms. Judy Flaschar, Ms. Cheryl & Cameron Kennedy, Mrs. Sherry Manning, Mr. Louis Bishop, Mrs. Betty Hooks & Jourdain, Ms. Pam Greene & Alsaliene, Mr & Mrs James & Vernetta & JC Simuel, Coach Hatchett & Mary Beth Hatchett, Coach Paden and family, Coach Garrett and Robert Jenkins, Jr.
who dropped off items for his and another team, and returned at the end of the day to help with the calculations and packing of the items for distributions!!! : He is one of the many examples of our Ballers commitment to WINNING…. We will be participating in a Food Drive and magazine collection. Items from the food drive will be donated to the Lowcountry Food Bank, magazines will be given to local hospitals. Each team will be asked to donate items from the list provided below. There will be a prize for the team that brings in the most items in the food and magazine sections, i.e. there will be a team food drive winner and a team magazine winner. Please find listed below the items that we are asking your team to bring. While this is a team competition, at the end of the day, the real winners will be members of the Lowcountry community so we encourage all to bring any items that you may have at home. The food drive will take place only during the time period and day identified. Containers will be available to pack the items on that Saturday. The drop off site has been selected for ballers convenience as there will be several practices taking place throughout that day. Our second service project is being confirmed and should take place in May. More details to come!! Please do not hesitate to send me an email at djenkins@lowcountryballers.org if you have any questions. Thank you in advance for helping the Lowcountry community! Mayor's Office - First Day Festival pre-event activities. 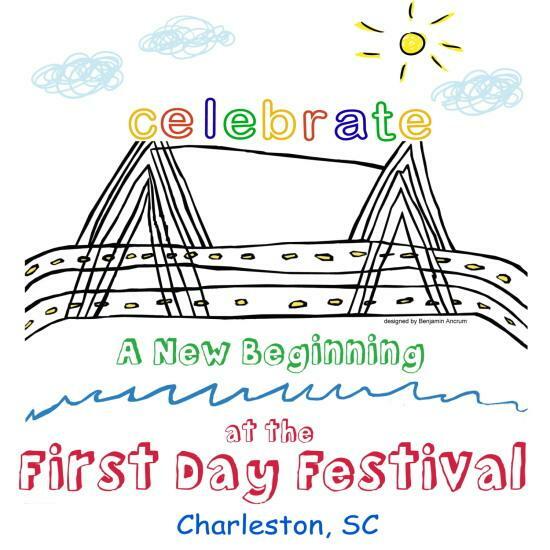 First Day Festival on Sunday, August 15. You were timely, worked hard and represented the Lowcountry Ballers well!! Mr. & Mrs. Hairston, Mrs. Hooks, Mrs. Hendrix. for ensuring the BALLERS successful participation! continued success in school this year! We're GLAD YOU ARE BALLERS! A Huge thank you for all of the Ballers, families and staff that participated in the Mayor's First Day Festival community service project. 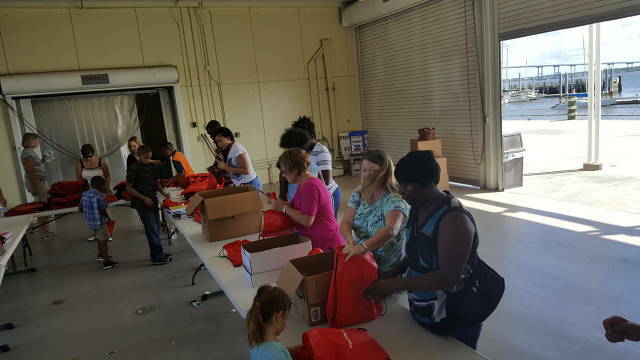 Because of all of your hard work, approximately 5,000 students were able to receive bags filled with school supplies during the First Day Festival on Sunday, August 16. You were timely, worked hard and represented the Baller organization well!! Thanks to all those who are not school age but understand the importance of service. To our Baller parents and coaching spouses, Ms. Welch, Ms. Frazier, Ms. Kinsey, Mrs. Bennamon and Mr. Gulley for jumping in and assisting the Ballers. Kudos to Coach Carter and Britton for lifting those many boxes of bags onto the trunk and to Coaches Gulley, Davis, Jenkins and Ms. Pam for assisting throughout the day. The sponsors were impressed by your hard work and I am GRATEFUL for your commitment to give back to your community. Best of luck in the classroom this year! A huge thank you to all of the Ballers and family members that participated in the Baller’s first community service activity. We had more then 35 participants at the First Festival. We know that Charleston County benefited from the water that the Ballers kept coming their way throughout the humid afternoon and the Charleston community as a whole will certainly benefit from the recycling assistance that other Ballers assisted with. The Kid Zone was the most active place around and the Ballers and family members that helped the children play tennis and other activities were wonderful! A special thanks to the parents that participated, Ms. Nelson, Ms. Haney, Ms. Hooks, Ms. Yates, Ms. Brice, and Ms. Frasier, yes very pregnant, all willing to bear the heat to support the girls. This is the first of what we hope will be a tradition with the Ballers, as it goes along way towards building character in the young girls that participate in the program annually. Best of luck in school and look forward to seeing all of you in the spring!!! 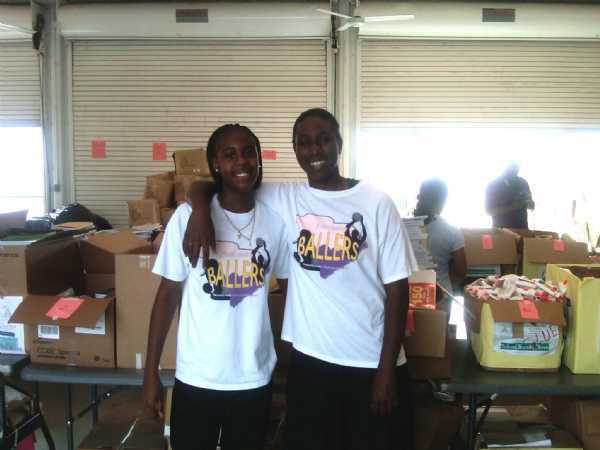 Click on Ballers Community Service - First Festival to see the Pics!